Water sources are a precious natural resource that we should all respect and protect. The Commission’s water is supplied by the City of West Columbia, which uses Lake Murray for its water source. 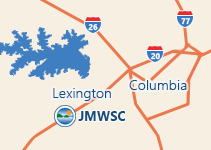 The Commission draws water from two connection points supplied by the surface water treatment plant on Old Cherokee Road. The water treatment plant has the ability to produce twenty-two million gallons per day, of which the Commission has acquired approximately eleven million gallons per day of the total capacity. Water is supplied to Lake Murray by the Saluda River. The Commission has 311 miles of water lines, 6 water booster stations, 5,200 valves, 1,600 fire hydrants, and serves over 13,000 water customers. Your water is tested on a weekly basis at numerous sites throughout the water distribution system to ensure that the Commission is providing the safest possible drinking water to you. Approximately seventy three thousand tests are performed every year at each water treatment facility to ensure the drinking water quality for the Commission’s customers. The Commission issues a Water Quality Report each year with detailed information on regulated detections. Our system also samples for a series of unregulated contaminants. Unregulated contaminants are those that don’t yet have a drinking water standard set by EPA. The purpose of monitoring for these contaminants is to help EPA decode whether the contaminants should have a standard. As our customer, you have a right to know that this data is available. Should you need additional information on your water quality please contact our Customer Service Department at 803-359-8373. The Commission routinely checks the water distribution system valves and fire hydrants to insure they function properly. Our maintenance program involves locating and exercising valves and test flowing fire hydrants. Our operators make sure they can adequately operate each valve and hydrant, that they are accessible, and most importantly that they work. Any hydrant found inoperable is immediately identified and marked accordingly until it can be repaired. Records are kept for each valve and hydrant as well as the size line they are connected to and the pressures and flow records at the time they are exercised. This data can be checked with the system conditions and validated through hydraulic modeling. This program helps keep our pipes clean by reducing mineral buildup in the lines and the flow information helps in planning for growth. It’s good practice to flush your own water distribution line and household plumbing if you have not used your water for an extended period of time, such as when returning from vacation. The longer water resides in your home’s plumbing, the more lead it a may contain. Even if you know that your plumbing does not contain lead, it is a good idea to flush to remove any stagnant water. If lead is a problem, we recommend you let the water run from the tap for thirty seconds before using it for drinking or cooking anytime the water in a faucet has gone unused for more than six hours. Ask your plumber if you need to flush more often because your household plumbing may contain sources of lead. To flush, let the cold water run form the tap until the water gets noticeably colder, usually this will take about 30 seconds. If you live a considerable distance from the water source, you may need to let the water run longer. *Plumbing code requires pressure regulators to be installed on services where pressures from the water distribution system are above 80 psi. Should you have any questions with regards to the water pressures at your point of connection with the system, please don’t hesitate to give us a call. The Commission reads your water meter every month using an Automated Meter Reading (AMR) System. This Itron radio data collection system uses vehicles equipped with radio units to read ERT (Electronic Read Transmitter) module-equipped water meters via radio without the need to access the meter. Mobile AMR dramatically improves meter reading efficiency. A radio transceiver, called a Mobile Collector, is installed in a utility vehicle. Route information is downloaded from the utility billing system and loaded into the radio transceiver. While driving along a meter reading route, the transceiver broadcasts a radio wake-up signal to all ERT meter modules within range and receives the ERT messages when they respond. Completed reads are uploaded to the billing system for bill generation. The Joint Municipal Water and Sewer Commission works hard to provide quality water and sewer services to its customers for the lowest possible cost. Water theft not only costs the Commission money every year, but it also imposes costs on all of our customers. Water theft could happen at hydrants or even in neighborhoods. If you suspect that someone is stealing water or hooked up to the system illegally, please contact us immediately. Tampering with a water system is a federal offense and we take protecting our customers very seriously.